Airline shopping portals are one of the best ways to earn lots of bonus miles without actually flying. Every once in a while, the programs offer a limited-time opportunity to earn an even bigger bonus — currently, United’s MileagePlus Shopping portal is offering some increased offers through early October. 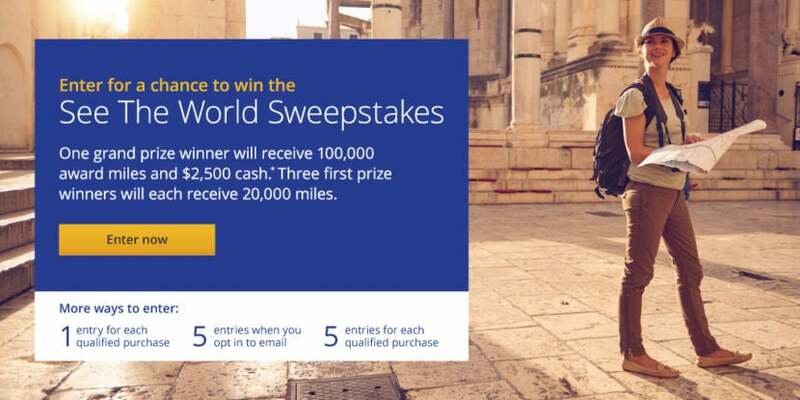 As part of this promotion you’ll also have an opportunity to win a grand prize of 100,000 award miles and $2,500 cash, or one of three first prizes of 20,000 miles each. You earn 1 entry when you register for the sweepstakes, 5 entries when you opt into marketing emails and 5 additional entries for each qualifying purchase (with a maximum of 25 entries per day). This round of elevated earning rates is split into three date groupings: September 30-October 1, October 4-5 and October 7-8. If you’re a cardholder of one of the United MileagePlus credit cards, such as the United MileagePlus Explorer Card, you’re already eligible for increased bonuses, but this could earn you even more. The card currently comes with a sign-up bonus of 40,000 miles after you spend $2,000 in the first three months. As you can see, there are some pretty nice increases here, particularly Neiman Marcus and LastCall, where you’ll get a 3x the standard rate. You’ll only have two days to take advantage of these increased bonuses, so if you’ve been eyeing a purchase from one of these merchants, now would be the time to go for it. The especially increased earning for Home Chef, Saks Off Fifth and a few others could be some sweets spots. Again, you’ll only have a couple of days to take advantage of these offers. The Shoebuy.com elevated bonus is especially intriguing and could bank you a good amount of bonus miles. Here’s an example of how this promotion can earn you a potentially significant amount of bonus miles. Let’s say you’re buying something on ShoeBuy.com during the elevated bonus period and you’re not a MileagePlus cardholder. If the pair of shoes you’re buying comes to $189.95, you’d normally earn 569.85 miles — worth around $9 based on TPG’s most recent valuations. With this bonus, however, you’ll earn 1,899.5 miles — worth about $28. The added bonus is pretty nice! In general, all of your online shopping should be done through your favorite airline’s shopping portal to earn bonus miles. And when there are increased earning levels through the shopping portal like right now with United MileagePlus Shopping, there’s even more incentive to do so. When you get miles in return for purchases that you were going to make regardless, you can work further toward that trip you’ve been saving up for — it’s a win-win situation.